Forget room temperature—here's the best way to serve these reds. The “rule” that red wine should only be served at room temperature deserves to be broken, or at least bent, when the weather is hot. But before popping your first-growth Bordeaux into the freezer, here are some do’s and don’ts. First, low temperatures accentuate tannins, the astringent compounds in red wines that come from the skins, seeds, and stems of grapes. They also boost the perception of acidity. Put a big, tannic Cabernet or Barolo on ice, and the first sip will sandpaper your palate. On the other hand, cooling down a lighter-bodied, less tannic red to about 55 degrees can make it incredibly refreshing. And giving a wine’s acidity a slight lift isn’t a bad thing—one reason we serve whites cold is to make them more vivacious and refreshing. Classic chillable red options include Beaujolais from France and Bardolino from Italy, but there are a plethora of varieties grown throughout Europe that work well. 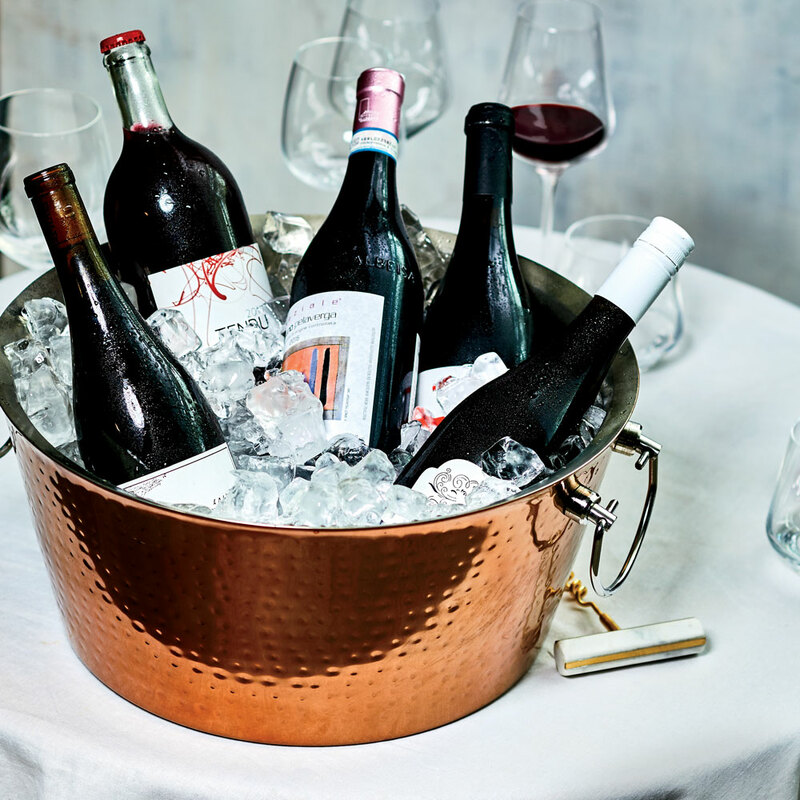 Plus, more and more New World winemakers are creating red cuvées specifically meant to be served cold. Check out our favorite new bottles below. The Zuccardi family dials down Malbec’s power with Bonarda in this strawberry-scented Argentine red. The wine is intended to be served chilled; Sebastián Zuccardi suggests 45 to 55 degrees. Sold in a clear glass 1-liter bottle sealed with a crown cap (like a beer),Steve Matthiasson’s California blend of Italian red varieties (Aglianico, Barbera, and more) is irresistibly gluggable. The peppery Pelaverga variety from Verduno, Italy, was nearly extinct 30 years ago. Only about 12 producers currently grow it; the Alessandria family is one of the best. Sicily’s Frappato grape is often used as a blending grape (as in Planeta’s Cerasuolo di Vittoria, also a good choice for serving cool). This varietal bottling is full of tangy cherry and citrus notes. For this crisp red, the grapes—stems and all—ferment in a vat filled with carbon dioxide, resulting in a vibrant, fruity, very low-tannin wine. Healdsburg, California–based winemaker Sam Bilbro’s lively “house” red is a subtle, aromatic blend of Dolcetto, Barbera, and Nebbiolo that’s superb with a light chill. This cherry-rich Pinot from Oregon’s Willamette Valley tastes great after a few minutes on ice. The Azores’ cool climate and volcanic soils come together to forge this ebulliently berry-rich red. Sonoma winemaking star Pax Mahle’s chill-friendly California take on cru Beaujolais is loaded with wild berry flavor.